For the waterfall on Ellicott Creek, Williamsville, see Glen Falls (New York). Glens Falls is a city in Warren County, New York, United States and is the central city of the Glens Falls Metropolitan Statistical Area. The population was 14,700 at the 2010 census. The name was given by Colonel Johannes Glen, the falls referring to a large waterfall in the Hudson River at the southern end of the city. 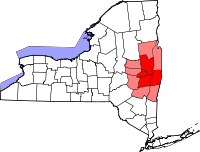 Glens Falls is a city in the southeast corner of Warren County, surrounded by the town of Queensbury to the north, east, and west, and by the Hudson River and Saratoga County to the south. Glens Falls is known as "Hometown U.S.A.", a title Look Magazine gave it in 1944. The city has also referred to itself as the "Empire City." As a halfway point between Fort Edward and Fort William Henry, the falls was the site of several battles during the French and Indian War and the Revolutionary War. The then-hamlet was mostly destroyed by fire twice during the latter conflict, forcing the Quakers to abandon the settlement until the war ended in 1783. Fire also ravaged the village in 1864, 1884, and 1902. The area was originally called Chepontuc (Iroquois; "difficult place to get around"), also referred to as the "Great Carrying Place," but was renamed "The Corners" by European-American settlers. In 1766 it was renamed Wing's Falls for Abraham Wing – the leader of the group of Quakers who established the permanent settlement – and for the falls on the Hudson River. Wing's claim to the name of the falls and the hamlet was transferred to Colonel Johannes Glen of Schenectady in 1788, either on collection of a debt, as a result of a game of cards, or in exchange for hosting a party for mutual friends, depending on which local legend is believed. Colonel Glen changed the name to "Glen's Falls," though it was often printed with varying spelling such as "Glenn's," or "Glens". The spelling "Glens Falls" came to be the common usage. A post office was established in 1808. Glens Falls became an incorporated village in 1839, and was re-incorporated in 1874 and 1887,[citation needed] expanding the village to what would become the city limits when the state legislature granted the city charter in 1908, at which time the city became independent from the town of Queensbury. In 2003, with permission from Queensbury, Glens Falls annexed approximately 49 acres (0.20 km2) of the town. The land, known as Veterans Field or the Northway Industrial Park, is on Veterans Road between Luzerne Road and Sherman Avenue and is just east of I-87. The land was vacant at the time. A thin, 0.5 miles (0.80 km) strip of Sherman Avenue was part of this annexation, to comply with state law on contiguity of annexed land. As a result, the city and town share co-own this stretch of highway. Civil War monument near City Park at the intersection of Bay and Glen Streets. Crandall Public Library – While the library has existed since 1893, it did not have a permanent home until 1931, with the completion of the library building in City Park, on property local entrepreneur Henry Crandall willed to the library. Charles A. Platt designed the building and Robert Rheinlander built it; it was renovated and expanded in 1969. The city completed the building's first renovation and expansion, involving the demolition of the 1969 addition, in November 2008. The library is a part of the Southern Adirondack Library System. Civil War Monument – A limestone obelisk at the intersection of Glen, South, and Bay streets, the monument was dedicated in 1872 to honor the 644 men from Queensbury who served in the Civil War. Ninety-five names, those of the men who died, are engraved on the monument. Many battles of the war are listed. DeLong House – Presently the home of the Glens Falls/Queensbury Historical Association and the Chapman Historical Museum. A Greek Revival and Second Empire edifice on the corner of Glen and Bacon Streets. A Queen Anne style carriage barn is part of the property. The Feeder Canal– Across from this historic canal is a hydro-electric power-plant on the Hudson River at Glens Falls. The canal was created around 1820 to feed water into the Champlain Canal. During the early 19th century, the New York State Canal System was crucial to the development of the state's economy. Lime, marble, lumber, and agricultural commodities were shipped from Glens Falls from the docks at the base of Canal Street. First Presbyterian Church - The congregation was chartered in 1803; its fifth house of worship was constructed in 1929. It was designed by Ralph Adams Cram in his "presbyterian style" of neo-gothic architecture. Fort Amherst Road – Located near this road is the site of the former Fort Amherst. While the fort no longer exists, parts of the wood foundations were known as late as 1880. The fort constituted a block house marking the halfway point on the road between Fort Edward and Fort William Henry at the head of Lake George. This fort system, erected by the British, was built to secure the colony's northern territories from French incursions during the French and Indian War. A restored fort house complex is available for viewing in the nearby town of Fort Ann. Louis Fiske Hyde House – The center among a triplet of revival-type residences constructed for the daughters of Samuel Pruyn by the architects Robert Rheinlander and Henry Forbes Bigelow, Hyde House houses The Hyde Collection, a world-class museum of European, American, and contemporary art. The principal collection is presented in its original domestic context as a private collection. The Oldest Building in Glens Falls – In 1864 a massive fire destroyed most of buildings in the central business district. The oldest building in Glens Falls, in the downtown area, is one of the few buildings in the city that predates 1864. The stone and brick structure at the bottom of the hill was erected circa 1815 and served as Calvin Robbin's blacksmith shop. Quaker Meeting House – Built in 1875, the Quaker Meeting House, an Italianate edifice on Ridge Street, originally did not have a heating system. St. Mary-St. Alphonsus Regional Catholic School – Formerly known as St. Mary's Academy, the school is on the corner of Warren and Church streets. It is in the neo-Gothic style of architecture and designed by Ralph Adams Cram. The building is listed on the National Register of Historic Places. It features a Great Hall with a two-story stained glass window designed by Henry Lee Willett Studios of Philadelphia. A New York State historical marker referencing American Modernist painter Wilhelmina Weber Furlong was placed near City Hall in 2013, during the Warren County Bicentennial. Furlong spent about a decade at the end of her life living and teaching in Glens Falls. According to the United States Census Bureau, the city has an area of 3.9 square miles (10 km2), of which 3.8 square miles (9.8 km2) is land and 0.1 square miles (0.26 km2) (2.54%) is water. The city is on the Hudson River, in the Adirondack foothills, at the border of Saratoga County, New York. As of the census of 2010, there were 14,707 people, 6,548 households, and 3,529 families residing in the city. The population density was 3685.97 inhabitants per square mile (1423.72/km²). There were 7,112 housing units at an average density of 1782.46 per square mile (688.48/km²). The racial makeup of the city was 94.7% White, 1.8% African American, 0.3% Native American, 0.6% Asian, 0.4% from other races, and 2.3% from two or more races. Hispanic or Latino of any race were 2.3% of the population. There were 6,548 households out of which 26.0% had children under the age of 18 living with them, 34.0% were married couples living together, 14.4% had a female householder with no husband present, and 46.1% were non-families. 36.2% of all households were made up of individuals and 10.7% had someone living alone who was 65 years of age or older. The average household size was 2.22 and the average family size was 2.91. In the city, the population was spread out with 24.3% under the age of 20, 6.8% from 20 to 24, 29.5% from 25 to 44, 27.1% from 45 to 64, and 12.5% who were 65 years of age or older. The median age was 37.6 years. For every 100 females, there were 94.3 males. For every 100 females age 20 and over, there were 90.9 males. The median income for a household in the city was estimated for 2016 at $46,305, and the median income for a family at $60,545. Males had a median income of $41,993 versus $37,988 for females. About 12.6% of families and 16% of the population were below the poverty line, including 23.9% of those under age 18 and 8% of those age 65 or over. The Glens Falls region is a major producer of medical devices. Glens Falls is home to Navilyst Medical, a medical device maker, previously a regional office of Pfizer and Boston Scientific Corporation. Glens Falls is also a principal provider of medical services for a vast 2,600-square-mile (6,700 km2) region from Saratoga County to the south, extending northward to the central Adirondacks. These services are centered around the Glens Falls Hospital, a 410-bed facility downtown. Founded in the summer of 1897 by a group of twelve local physicians, the Glens Falls Hospital was meant to serve the entire Upper Hudson River Valley. Solomon A. Parks donated his home in Glens Falls for the original hospital. The present structure has been extensively modified, enlarged, and modernized several times to better serve the needs of the community, and it is the region's fast-response trauma center. The hospital is now the area's biggest employer. A VA outpatient facility serves veterans' medical needs. Danfloss Flomatic Corporation is headquartered on Pruyn's Island in Glens Falls. The company is a leading manufacturer of industrial and municipal valves. Also on Pruyn's Island is Umicore, a Belgium-based company manufacturing silver-based contact materials. Finch Paper LLC, headquartered at the base of Glen Street hill, is a major regional employer and a manufacturer of specialty paper and forest products. It is by far the largest taxpayer in the City of Glens Falls, owning property assessed at $60-million in 2006, according to city records. In mid-June 2007, Finch Pruyn & Company announced it had sold all of its assets, including 161,000 acres (652 km2) of forestland in the Adirondacks, to Atlas Holdings of Greenwich, Conn. The Company name was then changed to Finch Paper LLC. Atlas then sold all of the forestland to The Nature Conservancy. The Glens Falls Cement company, established 1893, is now a part of Lehigh Northeast, itself a division of HeidelbergCement, one of the world's largest cement producers. Glens Falls has an old and prevalent history in the region's finance sector. Arrow Financial Corporation, headquartered downtown, is a publicly traded multi-bank holding company for Glens Falls National Bank & Trust Company (1851) and Saratoga National Bank and Trust Company. Evergreen Bank, N.A., formerly the First National Bank of Glens Falls, originated in 1853, and is now owned by banking conglomerate TD Banknorth. Advantage Capital Partners, a venture capital firm, has its New York offices downtown. The Greater Glens Falls area has a rich history of theatrical productions. The 300-seat Charles R. Wood Theater is home to the Adirondack Theater Festival (ATF), a professional non-profit summer theatre presenting new and contemporary plays and musicals. In addition to ATF, the Wood Theater provides numerous artistic and cultural presentations throughout the year. This theater opened in 2003 on Glen Street, in the heart of Glens Falls. A former Woolworth store, it now introduces culture and theater into the surrounding community. The theater is named for Mr. Wood, a successful local entrepreneur and founder of The Great Escape theme park, in Queensbury. The Glens Falls Community Theatre has produced theatrical productions in Glens Falls for nearly 75 years. The Lower Adirondack Regional Arts Council (LARAC) promotes the arts in the Glens Falls region, hosting an annual arts festival and maintaining a gallery open year-round at the Lapham Carriage House next to City Park. Music in Glens Falls is highlighted by the city's professional orchestra, the Glens Falls Symphony, which has been performing classical repertoire for 30 years. The orchestra is under the direction of Maestro Charles Peltz. From 1965 through 1997, Glens Falls was home to the Lake George Opera Festival, a professional company that staged several productions each summer. The company moved to nearby Saratoga Springs and is now Opera Saratoga. Glens Falls has three museums. The Hyde Collection is a world class European and American art collection situated in its original home context with modern gallery spaces. The Chapman Historical Museum is operated by the Glens Falls/Queensbury Historical Association and offers local history exhibits, educational programs, and tours of the historic DeLong House. The World Awareness Children's Museum is a children's museum focused on cultural diversity. Art in the Public Eye (APE) is a non-profit arts organization. Its mission is to cultivate a partnership between the area arts community and local businesses, to promote established and emerging artists and local commerce, and to create greater access to the arts through cultural activities and public exhibitions. APE programs include the Third Thursday Glens Falls Art Walk, Outdoor Cinema, Gallery 99, Art Cart, and Chalk Fest. Third Thursday events take place on the third Thursday of each month May through October at approximately 20 traditional and non-traditional venues downtown. The Shirt Factory Arts and Healing Center is a historic shirt factory that now houses artists' studios, shops, galleries, healing arts and services. More than 50 artists and 13 shops and galleries are in this building at the corner of Lawrence and Cooper Streets. The building was constructed in the early 1900s by architect Ephraim Potter, and is open to the public on a regular basis. The tenants hold yearly open houses, and a celebration of things locally made called LocalFest: Stuff Made Here is held every September. Glens Falls is also home of The Glens Falls September 11 Memorial, on the May Street side of the Glens Falls Fire Department headquarters at 134 Ridge Street. The memorial is a tribute to the lives lost on that day as well as a tribute to all first responders involved in rescue efforts at the World Trade Center and the Pentagon. The memorial consists of 12 foot, solid granite towers resembling the trade center encompassed by granite walls to resemble the Pentagon. It also incorporates a piece of steel from the World Trade Center on permanent loan from the NY/NJ Port Authority. The Post-Star is a daily newspaper printed in Glens Falls with a circulation of approximately 27,000 (30,000 on Sundays). The paper covers Glens Falls and Saratoga as well as the surrounding towns and counties of Warren, Saratoga and Washington. Established in 1895, it has been published since 1909. Writer Mark Mahoney won the 2009 Pulitzer Prize in Journalism (Editorial Writing) for his editorials on local government secrecy. The Chronicle is a free weekly newspaper with a summer distribution up to 37,000. Circulation at other times of the year ranges from 27,000 to 31,000. Established in 1980, founder Mark Frost remains The Chronicle’s publisher and editor. Local radio broadcasters include: WROW 590 AM, WGY 810 AM, WABY 900 AM, WMML 1230 AM, WENU 1410 AM, and WWSC 1450 AM; WVCR 88.3 FM, WMHT-FM 89.1 FM, WLJH 90.7 FM, WSPN 91.1 FM WLJH 90.7 FM, WFLY 92.3 FM, WGFR 92.7 FM, (college radio station), WEZF 92.9 FM, WYAI 93.7 FM, WNYV 94.1 FM, WBAR 94.7 FM, WYJB 95.5 FM, WCQL 95.9 FM, WDCD 96.7 FM, WTRY-FM 98.3 FM, WCKM-FM 98.5 FM, WRVE 99.5 FM, WFFG 100.3 FM, WJKE 101.3 FM, WNYQ 101.7 FM, WKKF 102.3 FM, WQBJ 103.5 FM, WAMC 103.9 FM WTMM-FM 104.5 FM, WQSH 105.7 FM, WPYX 106.5 FM, WKBE 107.1 FM, WGNA 107.7 FM. WAMC 90.3 FM and North Country Public Radio 97.3 FM are the public radio stations. Glens Falls has a tradition of minor league hockey. The highly successful Adirondack Red Wings, four-time Calder Cup champions of the American Hockey League, played in the city from 1979 to 1999. When the parent Detroit Red Wings disbanded the franchise, it was replaced by the Adirondack IceHawks of the United Hockey League, which was renamed "Frostbite" in 2004 before it folded in 2006. From 2009 to 2014, the city was the home to the AHL's Adirondack Phantoms, the principal farm team of the Philadelphia Flyers. On May 16, 2014, the Calgary Flames announced the Adirondack Flames would be their AHL affiliate. The Flames played one season before the AHL underwent a large realignment before the 2015–16 season and the Calgary Flames moved their AHL team to Stockton, California (renamed to Stockton Heat) and moved their ECHL team to Glens Falls, called the Adirondack Thunder. Glens Falls' East Field is home to the Glens Falls Greenjackets of the Empire Football League. The Greenjackets started in 1928 and is the second oldest-active semi-pro football team in the country. The Greenjackets are 2008 & 2009 NAFL Empire Division Champions (10–0) and the 2009 NAFL North Atlantic Region Champions (14–0), and finished the season at 14–1 as the NAFL Eastern Conference Runners-up, 2009 NAFL Elite 8. The city is also home to the Glens Falls Dragons, a baseball team playing in the Perfect Game Collegiate Baseball League, a collegiate summer baseball league. Since the team's inception in 2003 it has played at East Field. Glens Falls is part of the Albany/Schenectady/Troy television market. One low-powered station originates from Glens Falls, WNCE-CD (TV-31), broadcasting from its studios on Glen Street in downtown. Offering a variety of locally produced programs, the station's signature show is a weeknight news program, called North News 8. The 1982 film Basket Case was partially filmed in Glens Falls. In 2007, the movie Love Conquers Paul was filmed at various location in Glens Falls. Glens Falls and the natural formation of the bedrock beneath it served as inspiration to James Fenimore Cooper in his historical novel The Last of the Mohicans. Julia Spencer-Fleming's mystery novels are set in fictional Millers Kill, New York in the Glens Falls area. Ian Fleming's novel The Spy Who Loved Me features scenes in Glens Falls. In The Witch of Hebron (2010) by James Howard Kunstler, several characters visit Glens Falls. The Rick Bass short story "Field Events", which appears in his 1994 collection Platte River, is set in Glens Falls. The Glens Falls Civic Center opened in 1979 and hosts sports and entertainment events in downtown Glens Falls; it includes an arena for sporting events, concerts, family activities, dance, theater and trade shows as well as banquet facilities. The Civic Center includes 4,806 permanent arena seats focused on an ice hockey/basketball-type arena, but it can accommodate up to 7,800 people for concerts and other events. The arena is the home to the ECHL's Adirondack Thunder. [citation needed] The facility was renamed Cool Insuring Arena in 2017. The Glens Falls Tennis and Swim Club is a private membership club offering recreational and competition tennis since 1965 at the city's eastern border in the town of Queensbury. Floyd Bennett Memorial Airport (IATA: GFL, ICAO: KGFL) in Queensbury, formerly the Warren County Airport, provides convenient access to the Glens Falls region for small and charter aircraft. For major air travel, the region is served by the Albany International Airport in Colonie, New York, 40 miles south of Glens Falls. The Greater Glens Falls Transit System, or GGFT for short, provides regular bus service for the city and surrounding communities. The buses originate at the Ridge Street terminal, across from City Park and City Hall. In addition to the year-round buses, the system operates seasonal trolleys to Lake George. National service is available through Trailways and Greyhound, which operates a terminal near the GGFT bus terminal, on Hudson Avenue. Amtrak, the national passenger rail system, provides service to Glens Falls via nearby Fort Edward in the town of the same name. The daily Adirondack (Montreal-New York City) and Ethan Allen Express (Rutland, Vermont-New York City) serve the station. Interstate 87 – Bypassing Glens Falls to the west, the highway commonly known to locals as the Adirondack Northway has three exits serving Glens Falls. Exit 17N uses U.S. Route 9, and travels to Glens Falls via South Glens Falls. Exit 18 uses Main Street (Warren County Route 28), and is the exit recommended on guide signs for downtown and hospital access. It also accesses the West Glens Falls section of Queensbury. Exit 19 uses New York Route 254 northwest of the city, with access to the northern portions of the city via Glen St./Route 9, Bay Rd., and Ridge Rd./Route 9L. U.S. Route 9 – Known as Glen Street throughout Glens Falls. Enters Glens Falls from the south on the Cooper's Cave Bridge, crossing the Hudson River from South Glens Falls. Runs through the central business district north into Queensbury. This is a historically significant corridor, once a plank stagecoach toll road to Lake George, and prior to that the military road during the French and Indian War connecting Fort Edward and Fort William Henry. New York Route 32 enters with U.S. Route 9 from the south via the Cooper's Cave Bridge, then leaves Route 9 at Centennial Circle as it turns to the east on Warren Street. The road leaves Glens Falls to the east in the industrial district of the city, connecting the city with nearby Hudson Falls and Fort Edward. Truck traffic may bypass the downtown traffic and Centennial Circle via Oakland Street, which is designated Truck New York Route 32. New York Route 9L starts at the intersection of U.S. Route 9 and New York State Route 32 at Centennial Circle, and travels northeast towards the town of Queensbury. The road is known as Ridge Street, becoming Ridge Road at the city line. Glens Falls has a radial street pattern originating from its colonial settlement. The city falls within two school districts, both of which are fully independent of the city government. The majority of the city falls within the Glens Falls City School District,[citation needed] which includes parts of the town of Queensbury. The Glens Falls City School District operates Glens Falls High School, a middle school and four neighborhood elementary schools (Sanford Street School, Big Cross School, Jackson Heights School and Kensington Road Elementary School). Sanford Street School is closed at the end of the 2010–2011 school year. The Glens Falls Common School District operates an independent public elementary school, Abraham Wing Elementary School, named for a founder of Glens Falls. Saint Mary's–Saint Alphonsus Regional Catholic School serves children in pre-kindergarten through grade eight as a regional parochial school. Glens Falls, since incorporation as a city in 1908, has had a strong mayor charter. The city's Common Council has six members; one is elected to represent the city at large while the other five are elected from wards. The city is represented on the Warren County Board of Supervisors by five supervisors; one supervisor is elected from each Common Council ward. Such "city ward supervisors" do not have any duties in city government but have all the rights and privileges as any other member of the County Board. Departments of the City include: Cemetery, Community, Fire, Police, Public Works, Purchasing, Recreation, Controller, Assessment, Civil Service, Clerk, Water & Sewer, and Buildings and Codes. A balloon festival has been held in the Glens Falls area, with events at the Floyd Bennett Memorial Airport and Crandall Park, in mid to late September every year since 1973. The event draws upwards of 150,000 people over 4 days, and has been named one of the Top 100 events in North America. Originally organized by Walt Grishkot, the event is free to the public, and generally lacks commercialism. A Professional Rodeo Cowboys Association (PRCA)-sanctioned charity rodeo. The LARAC June Arts Festival, held annually since 1972, is considered the first major summer event in the Glens Falls region and it draws crowds of more than 25,000. With the juried art and craft show as its centerpiece, the LARAC June Arts Festival also offers live entertainment by regional performers, food concessions by local non-profits, and activities for the whole family. It is free and open to the public, 10 am-5 pm both days and is held rain or shine. Each March, The New York State Boys' Public High School Basketball Tournament is held at the Glens Falls Civic Center. This annual tradition has occurred since 1981. 2011 marks its 30th anniversary at the facility. The Federation Basketball Tournament of Champions are also held at the Glens Falls Civic Center. The Northcountry Microbrew Festival began as a charity fund raising event to benefit the Downtown Glens Falls area. Each year, a different charity is chosen to receive the proceeds. The event takes place at the historic Queensbury Hotel in downtown Glens Falls. The Third Thursday Glens Falls Art Walk artist's receptions are held at various locations in downtown Glens Falls in the evening on the third Thursday of each month during the summer and fall. "Hacksaw" Jim Duggan – professional wrestler of Mid-South, WWF and WCW fame. Glens Falls native. Jimmer Fredette – former combo guard for Brigham Young University's basketball team and consensus 2011 college player of the year; Glens Falls native. As of December 2016, plays for the Shanghai Sharks. Ferris Greenslet – editor of the Atlantic Monthly (1902–07), was born in Glens Falls. Carlyle Harris – convicted murderer; executed in 1893 for poisoning his wife. Peter Mahovlich – retired All-Star hockey player who was on four Stanley Cup-winning teams and is a member of Canada's Sports Hall of Fame, resides in Glens Falls. Ed Reulbach – MLB pitcher with the Chicago Cubs during the early 1900s; 1907 and 1908 World Series champion; died in Glens Falls. Kate White – former editor-in-chief of Cosmopolitan Magazine; identifies Glens Falls as her hometown. ^ Official website, cityofglensfalls.com; accessed February 16, 2018. ^ a b "Population and Housing Unit Estimates". Retrieved June 16, 2018. ^ a b c d e "American FactFinder: 2010 Demographic Profile Data – ZCTA5 12801". United States Census Bureau. Retrieved June 16, 2018. ^ a b c "History of Warren County, H. P. Smith – Chapter XXV: History of the Patent and Town of Queensbury – Part 2". Ancestry.com. Retrieved July 26, 2010. ^ a b c d e f Glens Falls Historical Association (1978). Bridging The Years: Glens Falls, New York 1763–1978. Glens Falls, NY: Glens Falls Historical Association. ISBN 0-8081-3885-5. ^ "Towns and Cities of the Southern Adirondacks: City of Glens Falls, Warren County". Adirondack Regional Chamber of Commerce. Archived from the original on March 17, 2010. Retrieved July 26, 2010. ^ a b "Time Line". Chapman Historical Museum Education Department. January 8, 2004. Archived from the original on February 3, 2010. Retrieved July 26, 2009. ^ a b c Randall, Thom (2003-05-21). "Town to cede industrial park". The Post-Star. Retrieved 2010-07-14. ^ a b Thompson, Maury (2003-10-26). "Glens Falls Common Council". The Post-Star. Retrieved 2010-07-14. ^ Google (2015-06-06). "Overview of 2003 Annexation" (Map). Google Maps. Google. Retrieved 2015-06-06. ^ a b Gereau, John (2002-04-04). "City, town to share Sherman Avenue strip". The Post-Star. Retrieved 2010-07-14. 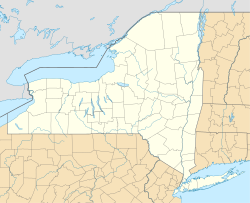 ^ "NEW YORK – Warren County – Historic Districts". Retrieved 2008-05-04. ^ "History Projects". Dr. Marilyn VanDyke, Historian, Town of Queensbury. Archived from the original on February 25, 2009. Retrieved 2009-03-18. ^ First Presbyterian Churchm Glens Falls, fpcgf.org; accessed May 21, 2017. ^ "Weber Furlong and the Origins of Modern Art October 6, 2013". Wilhelmina Weber Furlong on Lake George New York. The Hyde Collection Glens Falls NY. Archived from the original on September 24, 2015. ^ "Weber Furlong Historic marker dedication". Wilhelmina Weber Furlong on Lake George New York. Time Warner Cable Albany NY. ^ "NowData - NOAA Online Weather Data". National Oceanic and Atmospheric Administration. Retrieved 2013-03-04. ^ "Medical device maker gets new name". The Post-Star. 2008-08-04. Retrieved 2008-11-21. ^ Judd, Erin (2008-03-04). "Avista takes on state as partner in new medical device company". The Post-Star. Retrieved 2008-05-04. ^ "GFH Fast Facts". Glens Falls Hospital. Archived from the original on March 2, 2009. Retrieved 2009-06-06. ^ "Hospital History". Glens Falls Hospital. Archived from the original on March 2, 2009. Retrieved 2009-06-06. ^ "Glens Falls VA Outpatient Clinic - Location home page". Retrieved October 30, 2017. ^ Judd, Erin (2008-04-27). "Expanding on expansion". the Post-Star. Retrieved 2008-05-04. ^ "Cement Works to Suspend Operations" (PDF). The New York Times. December 9, 1903. Retrieved October 30, 2017. ^ "GFSO History". Retrieved 2008-05-04. ^ History of the Organization Archived December 24, 2013, at the Wayback Machine. Opera Saratoga. Retrieved 2013-12-23. ^ Lee Newspapers circulation figures. Accessed November 22, 2010. ^ Hajela, Deepti. "Papers win Pulitzers for bringing down gov, mayor". Associated Press (via Yahoo! News). Archived from the original on April 23, 2009. Retrieved 2009-04-20. ^ "Pulitzer Prizes 2009 (press release)" (PDF). Retrieved 2009-04-20. ^ "Glens Falls Chronicle". Retrieved August 20, 2015. ^ "Glens Falls Dragons". The Official Site of the Glens Falls Dragons. Retrieved 20 May 2017. ^ Basket Case, imdb.com; accessed April 11, 2017. ^ "The Book that Made Glens Falls Famous: An Introduction to James Fenimore Cooper's The Last of the Mohicans". external.oneonta.edu. Archived from the original on 2003-04-19. Retrieved 2018-01-11. ^ Wallace, David (1996). Infinite Jest. Back Bay Books. p. 93. ISBN 978-0-316-06652-5. ^ Glens Falls Civic Center website, glensfallscc.com; accessed May 21, 2017. ^ "Cool Insuring buys naming rights to Civic Center". The Post-Star. July 11, 2017. Retrieved October 13, 2017. ^ "Name comes off former Glens Falls Civic Center". The Post-Star. October 2, 2017. Retrieved October 13, 2017. ^ Glens Falls Tennis and Swim Club Archived May 15, 2008, at the Wayback Machine, gftsc.com; accessed May 21, 2017. ^ "Local Government Handbook: Public Education" (PDF) (6th ed.). New York State Department of State. 2009. pp. 75, 85. Retrieved March 21, 2011. ^ School Districts (PDF) (Map). Cartography by Queensbury Community Development Department. Town of Queensbury. Archived from the original (PDF) on June 9, 2011. Retrieved March 21, 2011. ^ "Directory of Schools". Glens Falls City School District. Archived from the original on August 17, 2011. Retrieved March 21, 2011. ^ Aquije, Omar Ricardo (March 21, 2011). "Glens Falls school board votes to close Sanford Street Elementary School". The Post-Star. Retrieved March 21, 2011. ^ "About us". Abraham Wing School. 2005. Archived from the original on August 11, 2011. Retrieved March 21, 2011. ^ "The Corners: Glens Falls Community History Project". Adirondack Community College. Archived from the original on 2007-07-18. Retrieved 2008-04-05. ^ Jessica Mokhiber (August 11, 2008). "Glens Falls Mayor Roy Akins passes away". YNN News (Albany region). Archived from the original on July 18, 2011. Retrieved February 17, 2018. ^ "Diamond reelected mayor of Glens Falls". YNN News (Albany region). November 4, 2009. Archived from the original on July 18, 2011. Retrieved February 17, 2018. ^ Goot, Michael (December 13, 2017). "Mayor Jack Diamond praised for accomplishments at his last meeting". The Post-Star. Retrieved February 17, 2018. ^ Goot, Michael (January 1, 2018). "Dan Hall sworn in as Glens Falls mayor". The Post-Star. Retrieved February 17, 2018. ^ "St Alphonsus Parish". ParishesOnline.com. Archived from the original on February 17, 2014. Retrieved April 14, 2015. ^ "New York Governor John Alden Dix". National Governors Association. Archived from the original on May 30, 2008. Retrieved July 15, 2009. ^ Woodworth, Gordon (February 24, 2011). "'Hacksaw' Jim Duggan to WWE Hall of Fame". The Chronicle. p. 7. ^ "Men's Basketball Athlete Profile – Jimmer Fredette". BYUCougars.com. Retrieved January 3, 2011. ^ "Jimmer Fredette selected for CBA All-Star Game". The Post Star. December 26, 2016. Retrieved 9 January 2017. ^ Begley, Ian (August 2, 2016). "Jimmer Fredette signs with Shanghai Sharks of Chinese league". ESPN.com. Retrieved August 2, 2016. ^ "Ferris Greenslet". Bartleby.com. Retrieved 9 January 2017. ^ Laughlin, Henry A. Proceedings of the Massachusetts Historical Society – Third Series, Vol. 72 (October 1957–December 1960). JSTOR 25080532. ^ Stubbs, Dave (February 22, 2016). "Bruins legend Hitchman deserves Hall recognition". NHL.com. Retrieved 17 January 2017. ^ "New York Governor Charles Evans Hughes". National Governors Association. Archived from the original on December 9, 2009. Retrieved July 15, 2009. ^ "JOHNSON, Frederick Avery, (1833 - 1893)". Biographical Directory of the US Congress. Retrieved 17 January 2017. ^ "Dave LaPoint Stats". Baseball Almanac. Retrieved November 6, 2012. ^ "Betty Little's Biography". New York State Senate. Retrieved July 15, 2009. ^ Lee, Don (Fall 1998). "About Lorrie Moore: A Profile". Ploughshares (76). ISBN 0933277237. Retrieved July 10, 2018. ^ Romano, Andrew. "The Anatomy of One Democrat's Loss: Murphy's Law". Newsweek. Retrieved January 3, 2011. ^ Donges, Patrick H. "Congressman Scott Murphy's Saratoga Springs district office is still open". The Record. Retrieved January 3, 2011. ^ "David Palmer Statistics & History". Sports Reference, LLC. Retrieved March 24, 2011. ^ Clehane, Diane (May 31, 2007). "So What Do You Do, Kate White, Editor-In-Chief, Cosmopolitan?". mediabistro.com. Retrieved July 17, 2009. Wikimedia Commons has media related to Glens Falls, New York.